Most of Bansko’s skiing opportunities are located just southwest of town on the slopes of Mt Todorka, which culminates in the 2756m peak of Todorin vruh. Access to the pistes is provided by the gondola which departs from Bansko’s lift station, located at the southwestern end of town. Passes can be bought from 4pm onwards on the previous day if you want to avoid queuing on the morning itself – you can’t purchase them in advance over the internet. Expect queues to get on the gondola itself – especially between the 9-10am ‘rush hour’. The lift-operating company Ulen run a ski-hire centre at the lift station. It’s by no means the only ski-hire place in town and you should check prices elsewhere before making your choice.It is rare that you would need to prebook your ski’s and boots. However it might be wise to prebook any lessons that you require. The gondola ascends in two stages, first to Chalin valog directly above Bansko, which is the starting point for a couple of shortish red runs. The second stage of the gondola climbs to Banderishka polyana, where a trio of chairlifts branch off to higher altitudes. To the west of Banderishka polyana lies Tsarna mogila, the longest of the intermediate routes, although there’s a much wider range of opportunities to the south, where the upper reaches of Mt Todorka host the densest network of pistes. An interlocking web of red runs descend down Todorka to the Shiligarnika area, while longer blue runs wind their way down to Shiligarnika via the so-called Plateau on the eastern shoulder of the mountain. 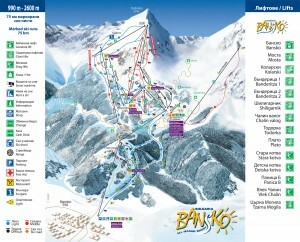 Todorka is also the start of the Alberto Tomba run, Bansko’s only black route, which ends up at Banderishka polyana. There are plenty of snacking, eating and drinking opportunities at Banderishka polyana, Shiligarnika and the Plateau. Save 5% on Transfers at Bulagrian Transport with Promo code "BRT15"